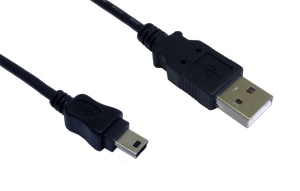 1 Meter Mini USB Cable, type A to mini B 5 pin. USB 2.0 A male to mini B pin. USB cable connects devices such as: digital camera, gopro and camcorders to a PC or power supply via USB port. USB A male to Mini B pin. A high quality cable kit for connecting your PC video card to your TV scart connector. 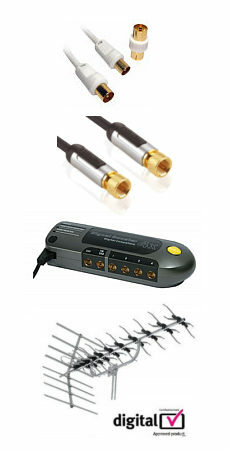 The kit features the following components:- 1m S-Video / SVHS high quality video cable, fully shielded high definition oxygen free copper cable, attractive silver finish connectors with gold plated contacts. 1m 2 x phono to 3.5mm stereo audio cable for connection between sound card and scart adapter. OFC Cable, metal body connectors with gold plated contacts. Scart adapter with gold plated contacts, connectors for s-video, composite video, left and right audio. The KVM CPU Switch Boxes allow you to access multiple computers from one keyboard, mouse and monitor. There is no interface card or software to configure. Installation is as easy as connecting cables between the CPU Switch and your computers. Operation is as simple as pressing buttons, entering hotkey command and navigating through the user-friendly on-screen menu (available on models with OSD support). The KVM CPU Switch is independent of computer operating systems, allowing the attached computers to run different applications. For KVM Switch Boxes with built-in OSD control, you can name your computers, switch to a computer from a list, configure settings with easy-to-use menus, view the name of the selected computer on-screen with programmable time interval. The OSD displays the system status throughout operation. Improved technology ensures steady OSD menu between computers of different VGA resolutions and smooth switching without leaving OSD garbage characters on the screen. The USB2-3010HUB is a USB 2.0 10 port hub that is quick and easy to install with driverless installation by taking advantage of Windows and MAC built in USB drivers.